The Alfa Romeo 156 was first manufactured by the Italian car manufacturers Alfa Romeo in 1997. Essentially a compact executive car the 156 was produced to replace the 155 and was introduced at the Frankfurt Motor show of 1997. The cars however, were actually made at the Fiat Group factory at Pomilgliano d'Arco and by the Thailand based General Motors plant. By 2005 more than 680,000 models had been produced, making the 156 one of the most successful cars ever for the Alfa Romeo company. Production of the car eventually stopped in 2007 when it was replaced by the Alfa Romeo 159. 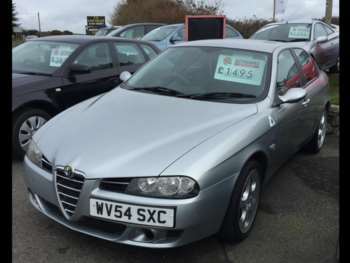 The used Alfa 156 was produced as both a 4 door saloon and a 5-door estate the former featuring a front engine and a front wheel drive operation while the estate version was a four wheel drive model. The car was produced in various engine sizes ranging from a 1.6 litre straight-4 version to a 3.2 litre V6 version. Each model featured either a 5 or 6 speed transmission that was either manual or semi-automatic. The estate version was popularised by the advertising campaign that featured Catherine Zeta Jones and was originally marketed as a 'lifestyle' type estate rather than one that was designed for large carrying capacities. The estate version continued to be produced until 2007 two years after production had stopped for the saloon version. The Alfa Romeo 156 features a particularly unique style that was based on the work of Walter de Silva who was the head designer at the Alfa Centro Stile. The high and curved flanks, the unique deep grille in addition to the 'sweeping' profile and the retro-style door handles is what gave the car its unique appearance and one which many concluded made it the best looking car in the compact car class. 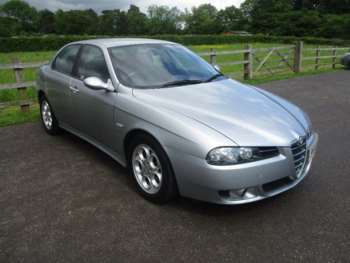 With regards to the interior design the second hand Alfa Romeo 156 was essentially based on the interior of the 166. The most characteristic features of the interior are perhaps the upper dashboard, which is deeply scalloped and the simple console that occupies the centre. As with most Italian cars the displays and controls are built in at an angle to the driver and the interior actually provides a good deal of foot room compared with other compact executive cars. Two major facelifts were given to the Alfa Romeo 156, the first in 2002 and the second in 2003. The first facelift saw improvements to both the interior and the exterior with matt finish paintwork and chrome headlights added to the exterior. The interior was now offered in a variety of different colours including several two-tone options. In addition, the 2002 version also featured xenon lighting, a Bose stereo system and tele-informatics. The 2003 facelift featured improvements by Giorgetto Giugiaro. A modified suspension, larger wheels and a sporty trim kit were also added to the top of the range model. The new version appeared somewhat more aggressive which at the time served to divide opinion with many concluding that they actually preferred the earlier 'prettier' version. Nonetheless, the Alfa Romeo 156 went on to win over 35 awards including the European Car of the Year Award in 1998 and What Car's Best Compact Executive Car also of 1998. Got a specific Alfa Romeo 156 model in mind?